So much to do! So much going on! I love summer! I also love that I have the summer off this year, and that there is so much to do locally in the city to fill up my days. Just this week I sat on the rooftop of Jackson square and ate my schnitzel sandwich from the market; in the breeze, with the sun, and the beautiful sound of Terra Lightfoot‘s voice singing CCR and Fleetwood Mac covers carrying through the open air. Sigh. Two young ladies "rushing" the stage. The next day I headed to Gore Park for their grand opening of the new designated pedestrian area and their Summer Promenade’s first of several weekly events. So nice to see pedestrians taking over that space and seeing crowds of people gathering and hanging out at Gore Park. 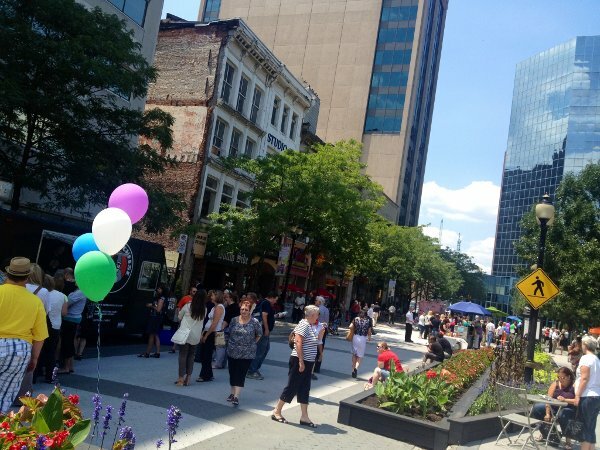 The Gore Park Promenade event with vendors, and live music runs Wednesdays, Thursdays and Fridays 11am-5:30pm until September 15th. Last night I joined the Stinson neighbourhood in Bishop’s Park for their weekly Thursday evening concerts: Songs From the Bishop, running from July 5th to August 23rd. It was such a nice and laid back community event, it just made me love where we live more than ever. I feel like I say this every month… but tonight’s art crawl is going to be an awesome one! There’s a craft show being put on by the newly open Mint Studio in the Sonic Unyon building (3rd floor). Blush’s pink trailer coming all the way from Guelph selling gorgeous and delicate women’s clothing in partnership with Beaux Mondes. The Sweet Ice Snow Cone ladies will be out selling their refreshing treats. Check out their promo video it is so adorably sweet! The AGH’s new Design Annex will be open for its very first art crawl. Dr. Disc will be celebrating its 21st birthday with bands like The Rest, New Hands, The Dirty Nil, and Greg Preston & The Great Machine playing on their rooftop. Plus after Dr. Disc’s Raise the Roof event there’s an after party at The Casbah. That’s a super packed crawl! On Saturday there’s also the Farm Crawl! It seems like everyday there’s something to do, and some place to check out.